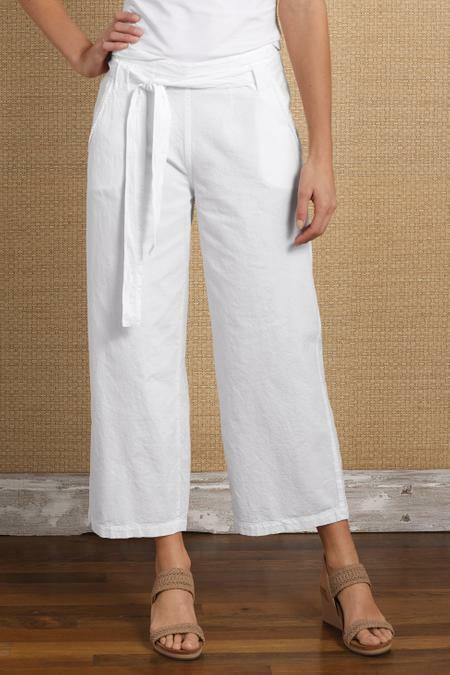 This timeless cropped pant of pure white cotton gives you a fresh, versatile wardrobe piece to pair with nearly anything. The self-tie belt is removable, creating the flexibility to wear a tank, swim top, summer sweater - and everything in between. Our designers also gave this crave-worthy capri a flat front waistband and an elasticized rear waist (after all, warmer weather does call for serious relaxation). Styled with a slightly wider leg for a flowy fit, these coastal chic capris will have you vacation ready in an instant. Front slanted pockets. Woven. Misses 23" inseam. Sits just below natural waist.